Life has been pretty busy. I am shocked to realize that my last “In My Kitchen” post happened three months ago! But, before 2011 says goodbye, I take you to a little virtual tour of what is happening in our kitchen, again inspired by Celia, who started these virtual tours and got many bloggers following her lead. My pressure cooker, that goes into reverse-hybernation during the warm months, but comes out to play in the Fall and Winter. Cooking beans, potatoes (mashed potatoes in 15 minutes), soups, stews, even risotto. Many people are afraid of pressure cookers, but nowadays they are very safe and easy to use. Ours even has a cool timer attached to the lid, that counts down from the moment it reaches full pressure, beeping when the time is up. A few goodies brought from Trader Joe’s during our short visit to Los Angeles last month. Assorted dried mushrooms, dried cranberries… Their Pound Plus dark chocolate bar is great for baking, although it’s hard to resist grabbing a little square here and there to nibble with a cup of capuccino. 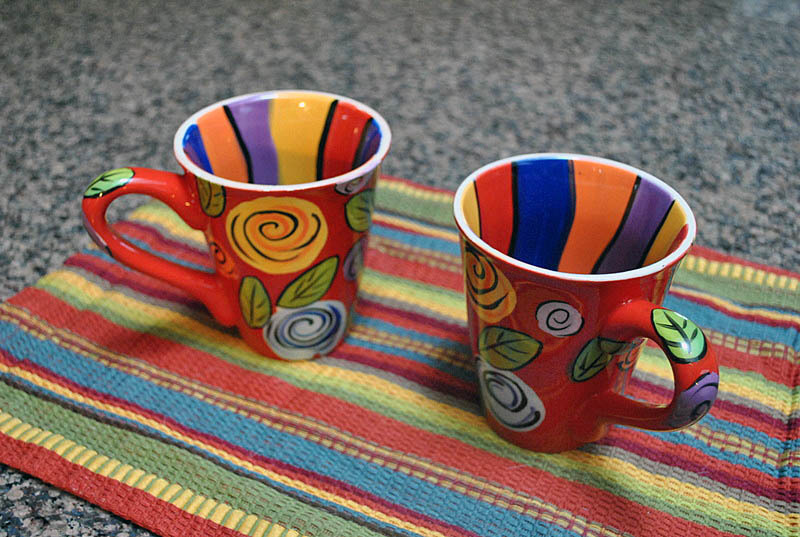 And, speaking of capuccino, as the weather turns cold and sometimes gray outside, we brought some color to our kitchen, with these fun cups to serve our first java of the day. But when only a shot of pure espresso will bring us back to life, these cute cups we bought in an antique store in Germany many years ago are perfect to enjoy them. A madeleine pan – a blog on madeleines will be up next year (it’s only a couple of weeks away 😉 – with a non-stick coating that helps these delicate little cakes come out easily after baking. But, I don’t use it only for baking…. Their shape is perfect for laying a piece of plastic wrap on top, and spooning items to be frozen. For instance, we love a particular brand of salsa (Victoria), but they only sell a huge bottle. We simply spoon portions on the madeleine pan and freeze the tray. After that, the portions are dropped in a zip lock container, and stored in the freezer. The shape of the madeleine pan is perfect for this use, better than muffin tins. 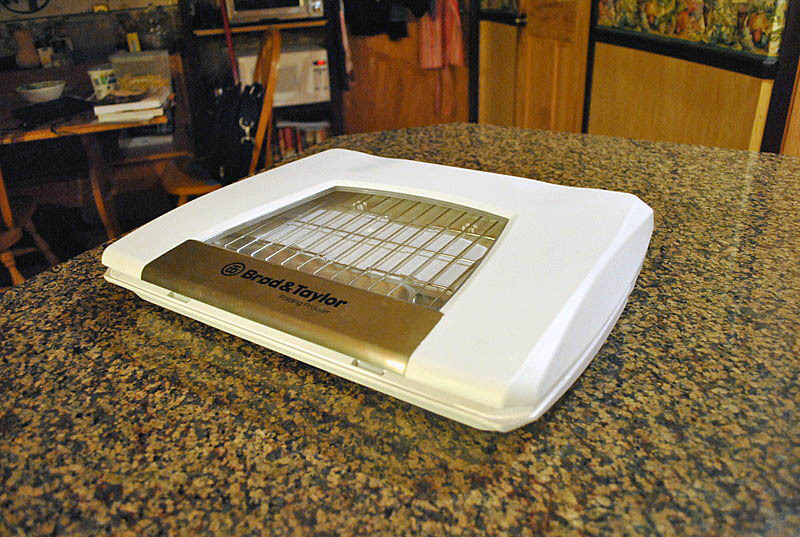 My most recent acquisition, a Christmas gift I gave to myself: a bread proofing box! It stores flat, but once you assemble it…. It turns into the perfect environment to proof starters and bread doughs, no matter how cold your kitchen is. I am absolutely smitten with it! Stay tuned for a post on my first bread made with it. A chandelier we brought from Brazil after my Dad passed away. It was in my parents living room, but my Mom moved out of that house and had to keep it stored in a box for years, waiting for a loving home. Phil painstakingly assembled it last week, looking at old photos to figure out how to do it. I know my Dad would love to see it in our home. I hope you enjoyed this little tour through our kitchen… So, what’s happening in YOUR kitchen these days? Oh Sally! That lamp is just gorgeous and the story is so touching. Hats off to Phil for assembling it from photos! What a great job! And I love your colorful coffee cups – a splash of color in the morning is always a great way to start the day (along with some caffeine!). 🙂 And dried mushrooms…love those too. Have a great weekend! What a unique kitchen. And so many elements reflecting the personal history of those who live there to make it even more special. I especially love your little cups and the madeleine pan. I have a mini version of the pan and have just spent a few weeks making several different kinds. I’m ‘madeleine’d’ out and starting on truffles for a while. I have some restraint, my dear husband actually gets one of those pounder plus and determines it to be for nibbling only…. 😉 It is really too bad we don’t have a Trader Joe’s around, such a great store! So good to see another In My Kitchen post! I love those! everything in wonderful (that bread box is going to my wish list), but your family lamp is beyond wonderful. What a great thing to have it in your own dining room, assembled by your loving and talented husband. I love it when you do an In My Kitchen post. I am going to Pittsburgh in two weeks and plan on stopping by Trader Joes. We will be moving there over the summer. I was wondering if I’d end up with a big drafty kitchen, if I do, I know how I will proof bread. What a wonderfully charming post, Sally, and how the things in your kitchen remind me of you. The chandelier is beautiful and I know that Phil put it together with love in addition to skill. Your kitchen and dining room reflect the personalities of you both, and that makes everything doubly special. Hooray! Thanks for playing again this month Sally! And what amazing stuff – I was just reading about the proofing box last week, and Joanna and I were wondering when they’ll come up with a 240V version. I can’t wait to see how you go with it, and if it’s as wonderful as it’s promising to be. Oh, you are killing me with the picanha adventure! Now you can cook it as a pro, so go for it! I edited my post to use “chandelier” instead of lamp, thanks for the word, I KNEW there was a better one! thanks for stopping by, Celia, and Merry CHristmas to you, the whole family, and the chicks! 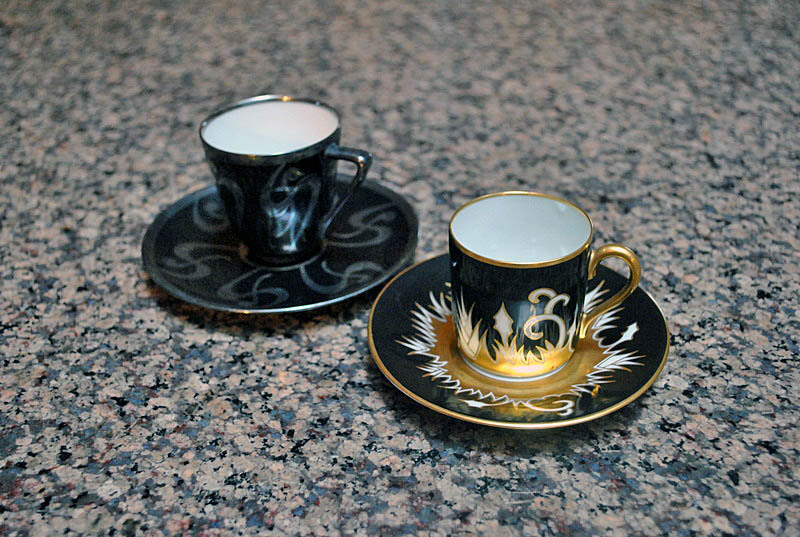 Love the espresso cups. 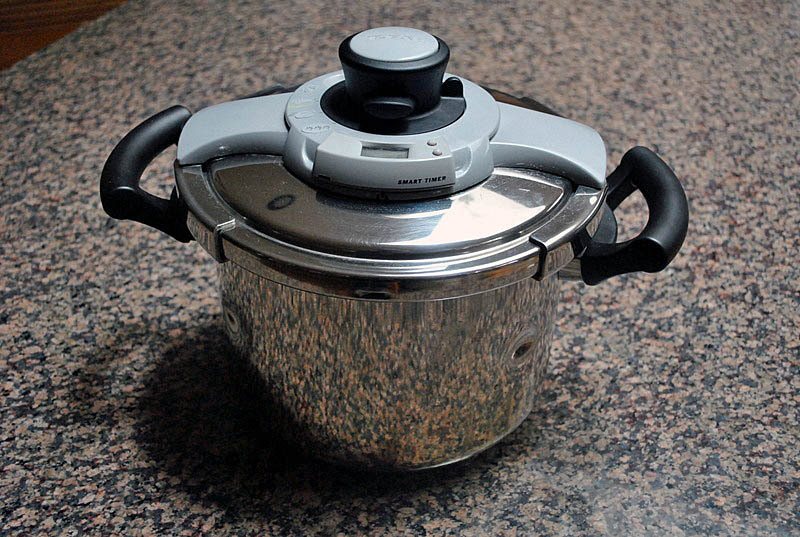 I also quite like the pressure cooker, boy could I use a pressure cooker, in case any one else happens to read this…. Just leave the computer open, you know, on this very page…. maybe you can place chocolate truffles next to it, or hot from the oven cinnamon rolls…. You…you’ve got the Flying Spaghetti Monster hanging in your dining room…? Wow. Will His noodly wonders never cease? Crossing my fingers we won’t have a strong earthquake, that baby would get damaged…. That lovely chandelier is so sparkly and must give you fond memories. Trader Joe’s.. well, I’ve read so much I’ve got to get there one day! Are you sure you didn’t order your pressure cooker from one of your lab catalogues? 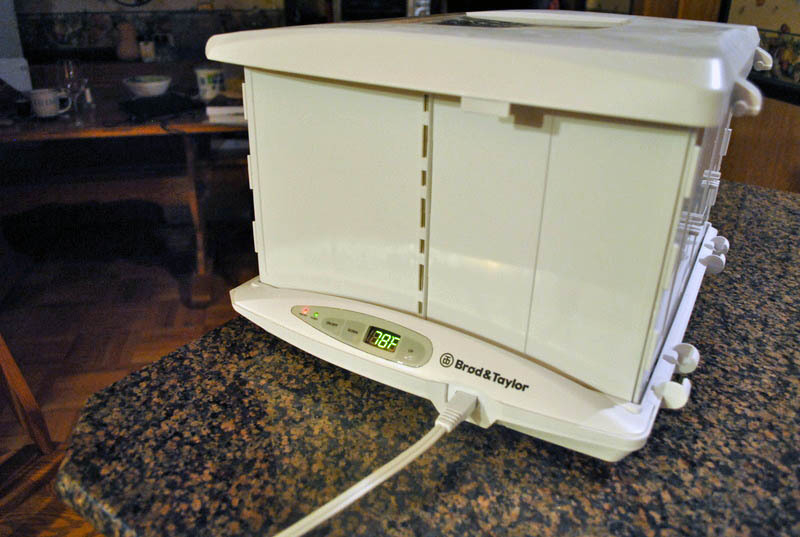 Got a bench autoclave instead? Hi Sally, I love when you do these segments – I always come away feeling like I’ve learnt something new and garnered some inspiration. 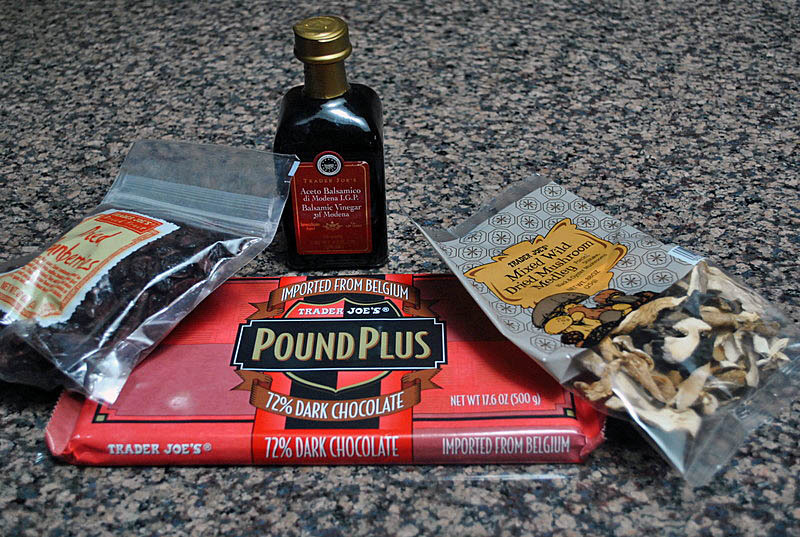 Love the pound plus dark chocolate (that’s my kind of bulk happiness!). I have never made Madeleines – can’t wait to see your post and what a brilliant application of the moulds for other uses…you’re full of great ideas Sally. 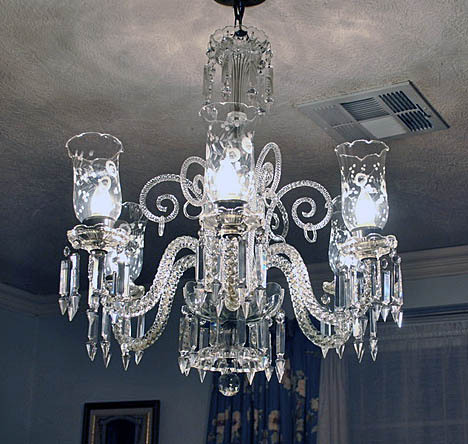 Kudos to Phil for assembling your parents chandelier – pretty spectacular looking, isn’t it? Glad you like these little tours… it’s fun to make them, Celia definitely hit the jackpot when she conceived the idea. I love the frozen use for the Madeleine pans- I’m going to do that, too! And I love the cups- all of them- thanks for the little tour in your kitchen. 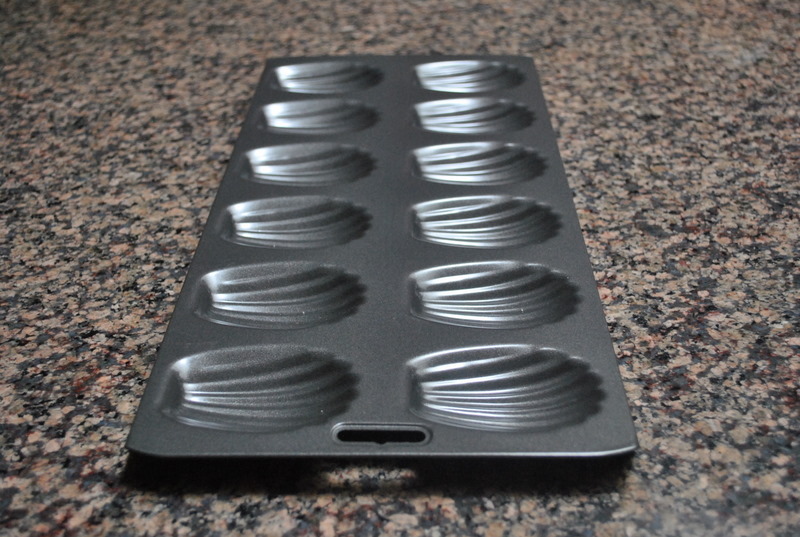 Good quality madeleine pans are not cheap in my area ($23 CDN for one that makes a dozen full sized madeleines). Luckily, if you’re not fussy about having the shape, you can bake madeleines in mini muffin tins and they taste just as good. 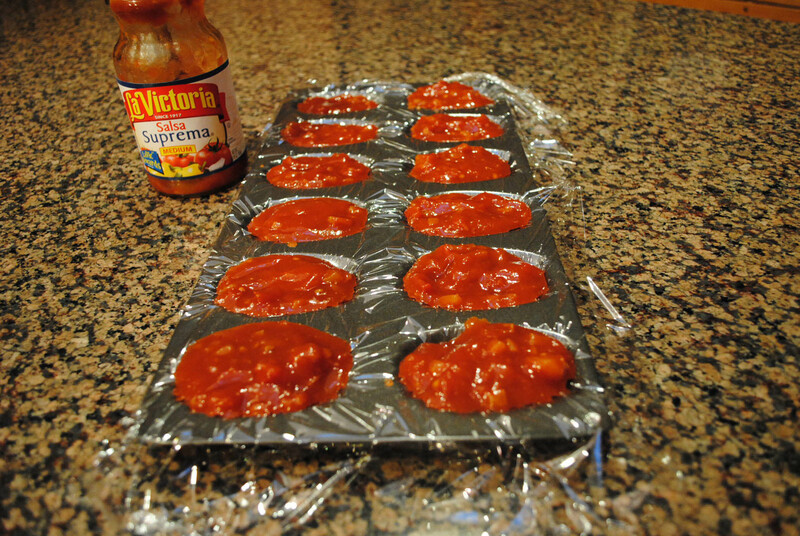 You could also freeze your salsa in the bottom of full-sized muffin tins. I would not buy the madeleine pan for that purpose, but since I already have them, it’s nice to find additional uses for it, kind of “multi tasking” a special gadget that otherwise would not be used very often. I had been keeping an eye out for a madeleine pan at a reasonable price and ended up spotting the last pan they had in stock at my food equipment playland which seemed like a steal at $8.25. I would have bought 2 (even though I’d never tasted madeleines and didn’t know if I’d even like them) cause I’m just like that. 🙂 It turned out to be a miniature madeleine pan the store had bought on a special purchase so no more were going to be available. When I found out, by running across the restocked full sized pans I was a bit frustrated but decided the single miniature pan was enough for me and a lesson for the future. So, no full sized madeleine pans for me and my extra batter goes into the mini muffin pans … that’s my version of multi-tasking but of the muffin pans. What a fun post! I love those crazy cups. And I’ve always wanted a pressure cooker! Crazy cups! Indeed! Perfect name for them… Amazing how they do brighten up my mornings…. that is one thing I don’t have that I really want- a pressure cooker. So do you really cook with it alot? Is it worth the money? I use the pressure cooker often enough to justify the expense, but not nearly as often as Brazilian families – black beans are cooked so often back home, that the pressure cooker is used several times per week. So, I guess it depends on what you intend to use it for – maybe you could search around the internet for recipes and articles on the pressure cooker, and see how it would complement your style of cooking. The chandelier is beautiful and the story behind it lovely. You asked what was in our kitchen. I’m thinking a proofing box needs to be in mine! Oh, the bread proving box sounds very interesting! Thanks so much for sharing your kitchen with us. I wish I had more counter space for something like a proofing box, especially at this time of year when I like baking bread but getting that first rise takes a while. Luckily, I have a good size microwave and I’ve found that if I bring a cup or so of water to a boil in a measuring cup first and then put my bowl of bread dough, covered with a cloth, into the microwave and close the door, the heat/steam will proof it wonderfully in an hour. Hooray for your madeleine pan! They’re some of my favorite things! I’m looking forward to your post! What a gorgeous chandelier! Your kitchen does reflect you.